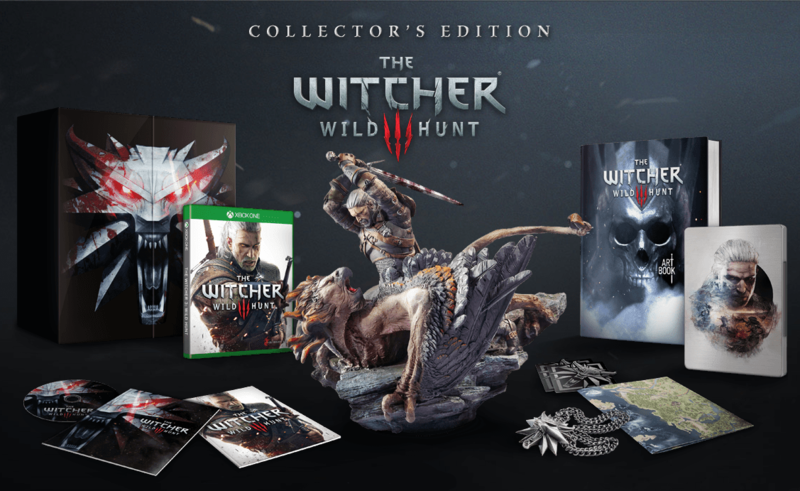 CD Projekt RED has recently announced Collector Editions of the upcoming Witcher 3 for the Xbox One, PlayStation 4 and PC. With that announcement they also gave everyone a video showcasing the items in the box with happens to include a hand painted figure of Geralt battling a griffen from the game. The Collector Editions of Witcher 3 will cost $149.99 and you can pre-order either copy now over at Amazon.com or Gamestop.com. 4 distinct factions: the mighty and cunning Nilfgaardian Empire, the brave Northern Realms and their siege weapons, the agile and devious Scoia’tael, and the brutal monsters of No Man’s Land. Powerful spells allow players to control the weather and affect units on the battlefield. An array of combat styles caters to individual playstyles: close range with heavy knights, long range with skilled archers or artillery with powerful siege weapons. Powerful hero cards, unique to each faction. The studio has also announced the inclusion of additional physical content in the Xbox One Collector’s Edition of The Witcher 3: Wild Hunt-Gwent, a highly addictive card game, and a unique cloth map of the in-game world. The Witcher 3 is set to be released on Feburary 24th, 2015.